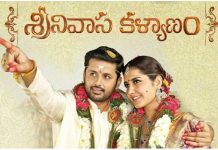 Nithiin – Vegesna Satish’s Srinivasa Kalyanam is gearing up for a grand release on the 9th of this month. The film has fetched good rates for the producer barring Nizam where he is releasing the film on his own. These rates are the second highest for the hero behind AAa which was sold for 30 Crores.